By 1918, the Indian born, self-thought mathematical genius Srinivasa Ramanujan was already making headlines all over the world, recognized as one of the most brilliant mathematician of his time. He was born into a poor Brahman family, and with no formal education. Luckily he came across a couple textbook maths, and since he didn’t have enough material, Ramanujan had to find solutions to problems on his own. While still a teenager, Ramanujan independently stated 6,165 theorems, some already known to Western mathematicians, others completely new. In 1914 he arrived at Cambridge on a scholarship, at the insistence of a professor called G. H. Hardy. Ramanujan’s time in England was most fruitful, expressing his talents in continued fractions and hypergeometric series. His health was another matter, and Ramanujan sadly fell ill with tuberculosis. One day, Hardy visited Ramanujan at the hospital as he regularly had before, stepping out of a black cab with the number 1729, “rather a dull one,” Hardy said as he met Ramanujan. The great mathematician begged to differ. Ramanujan had a fantastic memory and intuition about numbers. In the case of 1729, the number can be written as 1 cubed + 12 cubed and 9 cubed + 10 cubed. There’s no smaller integer that can be written as the sum of two cubes. 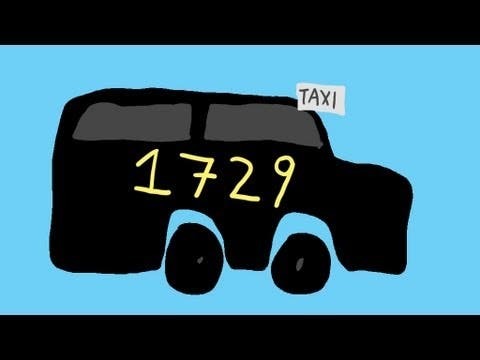 The incident launched the “Hardy-Ramanujan number,” or “taxi-cab number”, a mathematical oddity which had mathematicians fascinated to this day. Only six other taxi-cab numbers have been found that share the same properties (smallest numbers which are the sum of cubes in n different ways). But 1729 wasn’t just some quirky mathematical tidbit with no practical value, apart from entertaining mathematicians and Futurama fans. Ken Ono, a number theorist at Emory University, was perusing the Ramanujan archive while visiting Cambridge. He found notes scribbled by Ramanujan a year after Hardy told him all about his dull taxi number. Ramanujan used an elliptic curve – a cubic equation and two variables where the largest degree is 3 – to show that there are infinity many solutions that are near misses to solving the equation. It wasn’t a direct proof of Fermat’s last theorem, but it was pretty close – all inspired by 1729. In doing so, Ramanujan found something remarkable: a K3 surface – objects used in string theory and quantum physics. The thing is, K3 surfaces were first described, let alone named, in the 1950s or decades after Ramanujan’s untimely death in 1920. Ramanujan’s story will be turned into a film, soon to be released under the title: “The Man Who Knew Infinity.” Ono is one of the associate producers. Oh, and if you were curious, Fermat’s Last Theorem was solved in 1995 by Andrew Wiles.